This delicious recipe has been generously shared by one of our great cooks, Peggy. She’s always coming up with great recipes, full of tips and ideas. 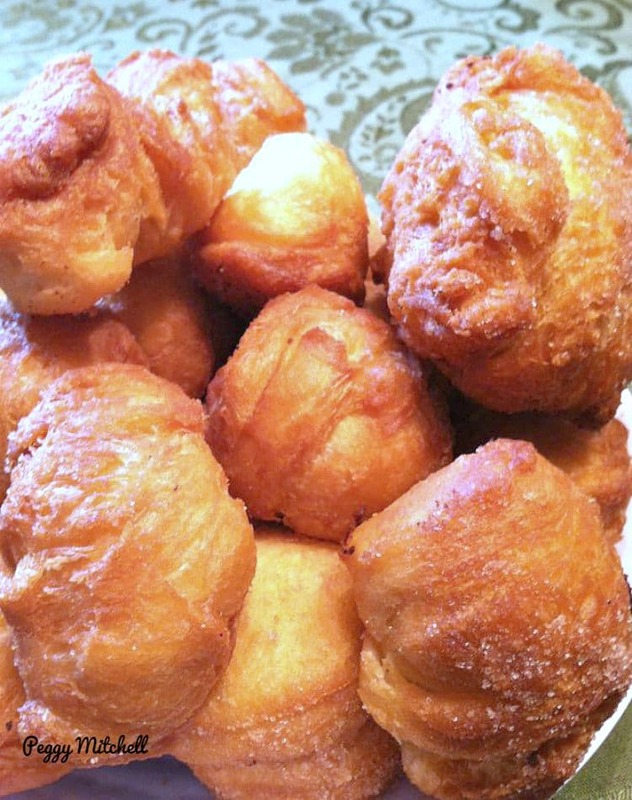 Here we have a great recipe for donuts, and Peggy has used one of our friends, Carina’s Pizza Dough Recipe! 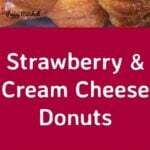 These strawberry cream cheese filled donuts are certainly a hit with the family, so be sure to make plenty! 3. Remove the dough from the bowl and transfer to a lightly oiled bowl and cover with plastic wrap. Let the dough rise in a warm spot until it doubles in size ( 1 1/2 to 2 hours). You may need to add extra flour while kneading so the dough will pull away from the sides of the bowl. 4. Transfer the dough onto a lightly oiled surface and lightly dust your hands and roll out balls to 1 inch in size then cover with a kitchen towel for about 10 minutes. 5. Heat oil 3 to 4″ deep in a heavy kettle or deep-fat fryer to 375 degrees. 6. Transfer doughnuts to the kettle of fat on a broad spatula, using care not to alter shape. (If possible, place board of doughnuts near frying kettle.) Slip into hot fat. 7. Add only enough doughnuts at a time as can float on the fat or that can be turned easily. Turn doughnuts as they rise to the surface. 8. Fry 2 to 3 minutes, or just until doughnuts are a golden brown. 9 Lift doughnuts from fat and drain on paper towels and then roll them whilst still hot in a bowl of sugar and ground cinnamon. Place on a rack to cool. 1. Crush the strawberries with a masher and mix thoroughly with the cream cheese. 2. Fill a piping bag with the filling. 3. 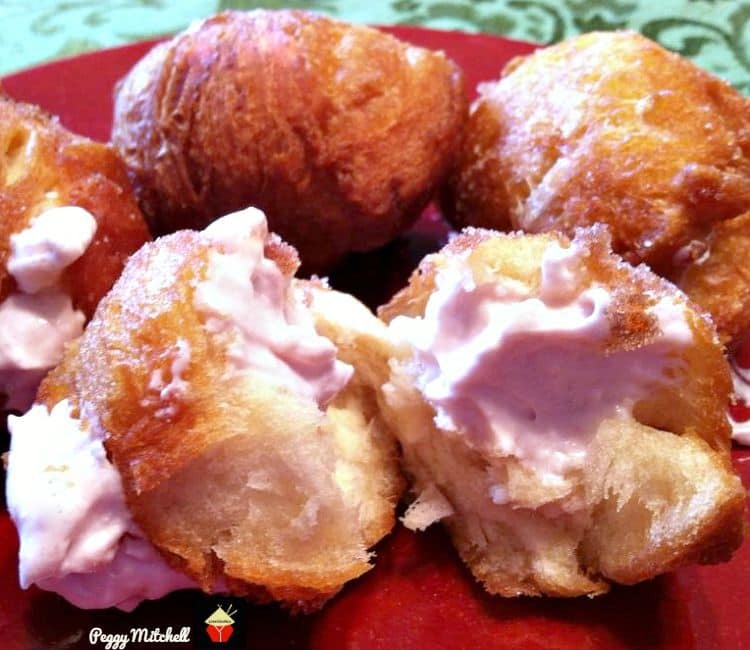 Pierce a hole in each donut and using a piping bag squirt the filling into each donut. Remove the dough from the bowl and transfer to a lightly oiled bowl and cover with plastic wrap. Let the dough rise in a warm spot until it doubles in size ( 11/2 to 2 hours). You may need to add extra flour while kneading so the dough will pull away from the sides of the bowl. Transfer the dough onto a lightly oiled surface and lightly dust your hands and roll out balls to 1 inch in size then cover with a kitchen towel for about 10 minutes. Heat oil 3 to 4" deep in a heavy kettle or deep-fat fryer to 375 degrees. Transfer doughnuts to the kettle of fat on a broad spatula, using care not to alter shape. (If possible, place board of doughnuts near frying kettle.) Slip into hot fat. Add only enough doughnuts at a time as can float on the fat or that can be turned easily. Turn doughnuts as they rise to the surface. Fry 2 to 3 minutes, or just until doughnuts are a golden brown. Lift doughnuts from fat and drain on paper towels and then roll them whilst still hot in a bowl of sugar and ground cinnamon. Place on a rack to cool. Crush the strawberries with a masher and mix thoroughly with the cream cheese. Fill a piping bag with the filling. 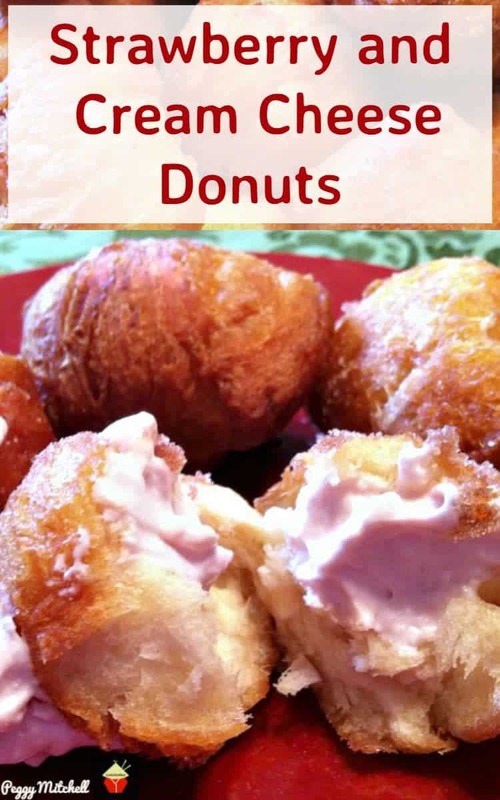 Pierce a hole in each donut and using a piping bag squirt the filling into each donut. Please note, prep time includes rising time for the dough, but it will be worth the wait!